The VA Showcase is simply the best meet in the entire nation and emblematic of what track & field is. It is a meet both for the ELITE and EVERY athlete by having both "Invitational" and regular events. After some major changes, the 2018 installment of this meet saw two WORLD RECORDS, a national record, and a staggering 17 US #1 performances. Best of all, the meet finished a combined 4 hours ahead of schedule over the course of competition. Fees are $15 per individual ENTRY and $40 per relay ENTRY. There are no limits in entries, we will be verifying all times to ensure seeding is properly done. We would prefer to have no "NT" seeds so that we can seed this entire meet and give legitimate estimated time schedules. A reminder to coaches: This is an ENTRY fee and not a competition fee. Checks should be made out to "VA Showcase"
Invitational events WILL BE RUN ON TIME, we will not move ahead for Invitational Events. All Invitational Events will be run slow to fast, all non-invitational events will be run fast-slow unless otherwise noted. There will be no guaranteed refunds due to cancellation. If weather and cancellation becomes a likely outcome we will email all coaches and make them aware of the situation and what will be done. Meet management is excited to announce The Holiday Inn Downtown & Fairfield Inn & Suites as our host hotels! These hotel will feature many added amenities. **We will have F.A.T. cameras at the 1500/1600/3000/3200 marks and Mile/2 Mile finish for the invitational sections of the Mile/Two Mile. For certain invitational events we will have en route F.A.T. splits as well. Updated information will be posted one month out from the meet, if you would like your state sanctioned please reach out to Meet Director Vincent Pugh. His email is listed above. This meet will be sanctioned for NFHS International competition and the following states: VA, MD, DC, NC, TN, OH, PA, NY, NJ, MA, DE, CT and others. Meet management is also excited to announce this meet being a NSAF Select Meet. For more information about the NSAF and entry into the National Championship, see their website here! This new facility is the best in Virginia and one of the best in the entire nation. It features a 200m hydraulically banking track. This means it will move up and down in terms of its incline based on the event happening. The Two Mile runs will be nearer a flat track while the 300m dash will have the bank all the way up. The facility has double horizontal straights, area for two high jump competitions, two pole vault competitions, eight sprint/hurdle lanes on the infield of the oval and a 50ft by 100m team area on the second floor. That area will be an overlook stretching nearly the entire length of the facility. On the other side of that overlook is a 100m long rubberized warmup track. These events include everything except the 4x800 which will be run right before the start of Saturday's Invitational events. Normal timed finals that are run fast to slow. Invitational events will be the top 10-15 or top flight of athletes entered into each event. These events will be run off at the exact time listed on the time schedule. In events where there are multiple sections the event will run slow to fast and in distance races have the top seed on the far outside. 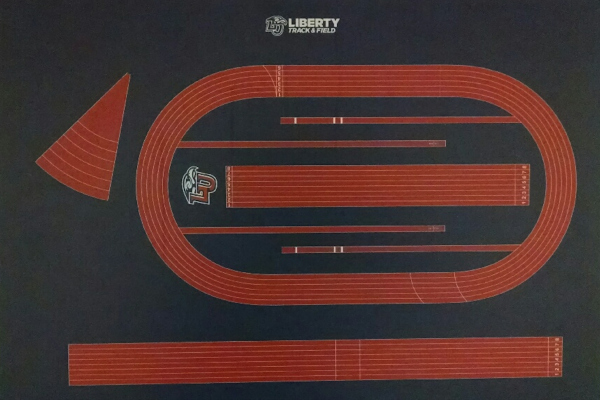 In the 4x200 and 300 we will be running lanes 3-6. Seeding for lanes will be done by meet management and based on a combination of current season bests and realistic predictions of what someone could run if they do not have a time. Preference of lanes for lane races on the oval are 4-5-6-3-2-1. Lake Braddock Girls DMR, Bullis School Girls 4x2, Katelyn Tuohy Girls 5K, Tyrese Cooper Boys 300, Brian Herron Boys 300.